Only 4 weeks into the new school term, Bishops Nympton Primary School are celebrating their golden achievement. 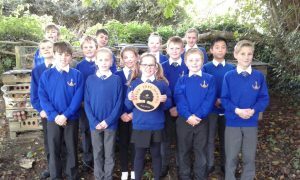 Through their efforts on green issues, such as tree planting, reducing our carbon emissions, and becoming a greener school through recycling and energy usage, we have been awarded the Woodland Trusts Gold award.The children have worked incredibly hard to achieve this prestigious award. Through learning about climate change and the impact that humans are having on our planet, it is clear to see that this work is now really making an impact. Our children are becoming passionate in their response to various green issues and continually look to develop the schools outdoor space in ways which benefit the school and the environment. The children fully understand that our work is not yet finished. 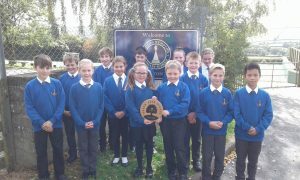 We have many more plans for our outdoor space and other tasks set by the Woodland trust, as we now aim for the Platinum award. 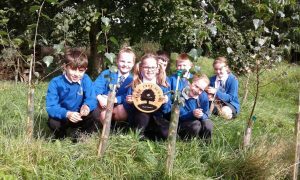 Through this work we aim to develop a life long interest in the natural world and a desire to look after our planet before it is too late!